NOW! 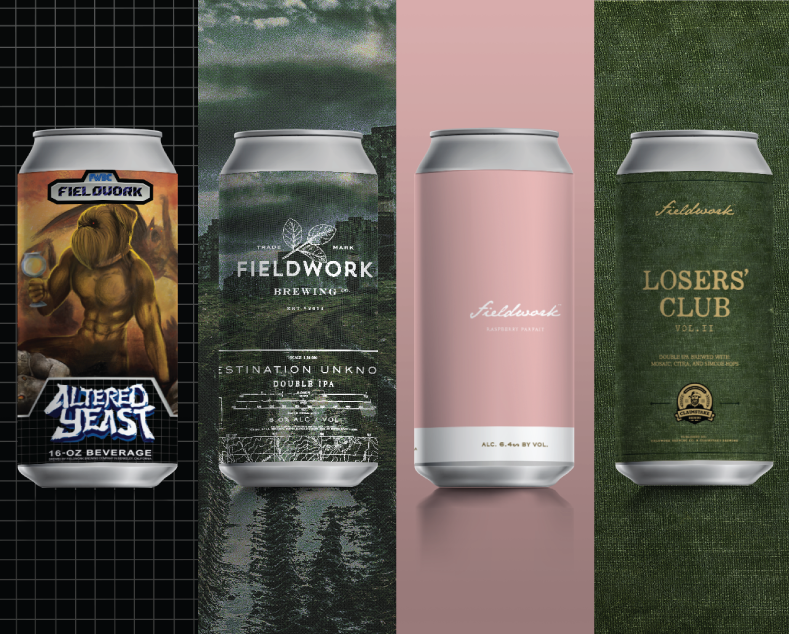 ONLINE PRE-SALE CAN RELEASE: Altered Yeast, Destination Unknown, Raspberry Parfait, and Losers' Club Vol. II! We are excited to release four delicious beers for Online Pre-Sale today. From the returns of Destination Unknown, Altered Yeast, and Raspberry Parfait to our first collaboration re-release with the return of Losers' Club Vol. 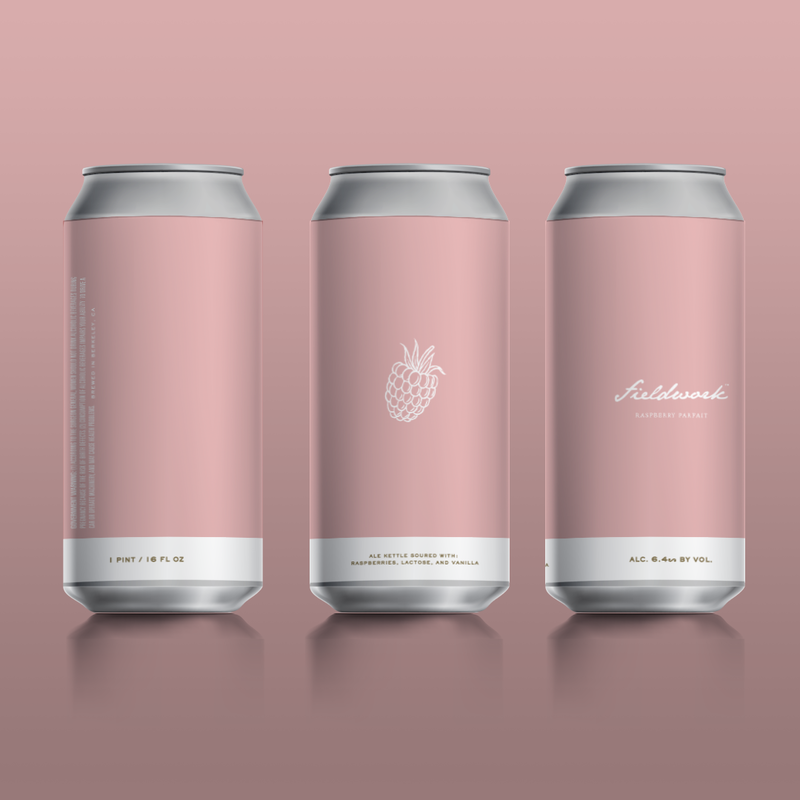 II, a collaboration with our friends at Claimstake Brewing. The online pre-sale begins now and will close on Friday, April 19th at 3 pm or sooner if all cans sell out. LIMITS: Limits for the Online Pre-Sale will be 1 case (24 cans) per person of each beer while supplies last. Growler fills of all beers will be available in house while supplies last however no Crowler fills are available. ORDER DETAILS: Please note that the person’s name on the order, the credit card used, and the ID of the person who picks up the beer must all match. No proxies or exceptions. ONLINE RELEASE DETAILS: Online pre-sale releases are fairly new for us so we don’t know how quickly they will sell, however the first online release sold out well in advance of the pre-sale closing time. Please note that your beer is only reserved once your checkout process is complete. Your cart will update if the beer has run out. ORDER PICK UP: The pick-up window will be 4/20 at opening to 4/22 at 9:00pm. If you do not pick up your cans by April 22nd they will be re-sold to the public and you will not be issued a refund. Spring is in full swing so come and enjoy a pint with friends on one of our patios or grab some beer to go. Order your crowlers ahead and we'll have them ready for you in an hour or less. 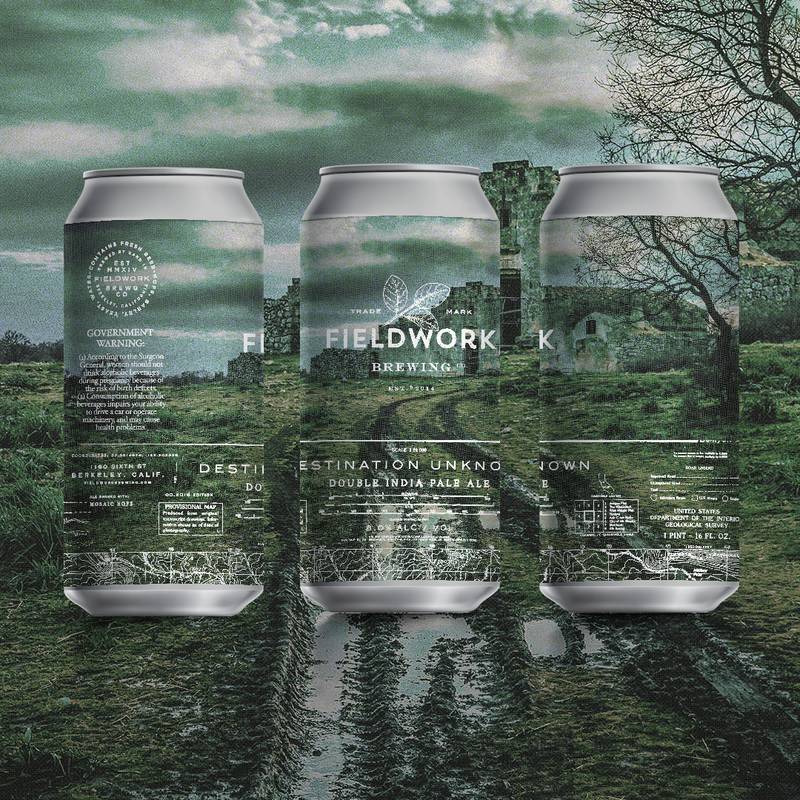 Pre-order your Crowlers for the weekend! Skip the line - We offer same day pickup of online Crowler pre-orders at all of our taprooms! Select your beers and choose a pickup time. Your Crowlers will be waiting for you when you arrive. It's that easy (and a great idea for pickups after you get your cans). We recommend ordering your crowlers and cans separately due to differences in pick up times. As always, well behaved adults, children and dogs are welcome. Yeast has been the true final frontier in IPA for quiet some time now; after decades of experimenting with hops, malt, and different water profiles, it's finally time for breweries to enjoy and explore the possibilities using expressive yeast strains. 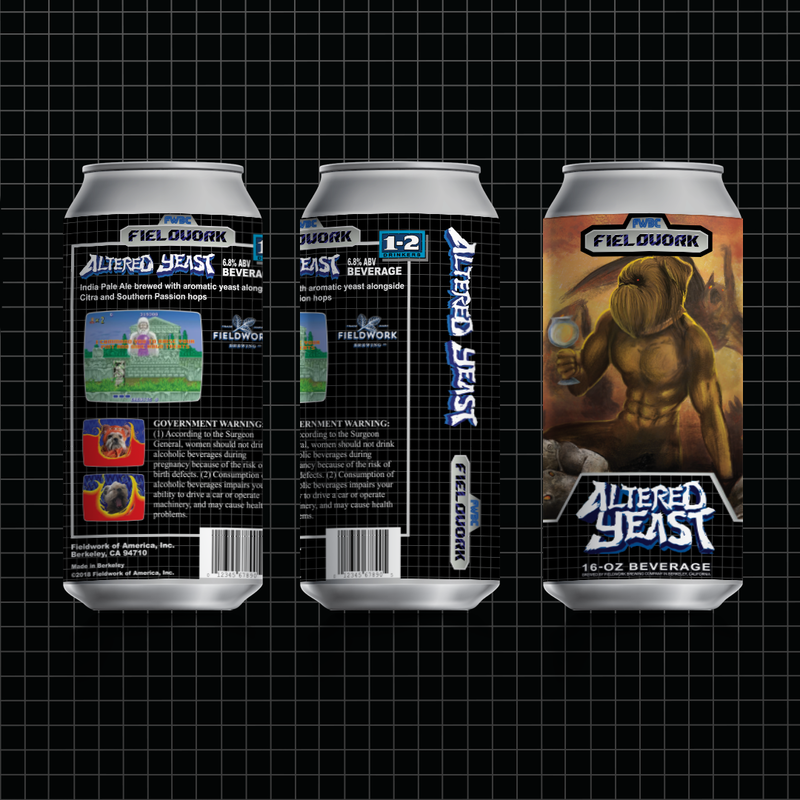 Altered Yeast is our IPA to celebrate the holy matrimony between yeast esters and hop aromas. Alongside using the best aromatic yeast strains we can find we also loaded this one up with two of the orangiest hops that ever have oranged; Citra and Southern Passion. These aren't two of our favorite hops for no reason, with huge notes of orange marmalade, tangerine zest, tampico, and canned peaches in syrup the Citra and Southern Passion hops pair perfectly with ester-forward yeast strains to create an absolute juice bomb that we just couldn't achieve with a neutral yeast strain. This batch we were lucky enough to team up with our friends at Berkeley Beer Science and they developed us a yeast strain unlike any other. Hyper-aromatic and infinitely unique this strain kicks you in the nose with huge aromas of banana Runts and Dubble Bubble bubble gum that make this beer taste like an IPA but smell like an Easter basket full of candy. Introducing from the dark depths of the east bay, Destination Unknown Double IPA. A Cadillac-sized hop bomb that cruises the streets of Berkeley leaving notes of grapefruit oil and honeydew melon in its wake. Pouring this beer on Shattuck, its hazy body looks like the fog rolling off of the bay with a head of hop resin that dissipates just as you hit Durant. As you slide past Sproul Plaza and the smell of patchouli wafts by you find refuge by planting your nose in the glass, and inhaling a ridiculous amount of Mosaic hop-induced notes. Fresh-squeezed grapefruit juice, ripe melon, fruit salad, and copious amounts of pot... ...wait, that last one is actually some kids lighting up on Channing. Keep on strolling, taking sips and enjoying the body that is saturated with Mosaic hops and sticking to palate like your feet to the floor of the 79 bus. By the time you hit Ashby you can't help but wonder how on earth you drank a pint glass out of a paper bag, but it doesn't matter, the remnants in the glass still boast huge hop aromas, just put your nose in that bag and inhale over and over. Don't worry, you'll blend right in. Time for another pint, hang a left on Adeline and see where Destination Unknown takes you. 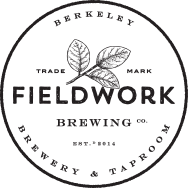 Fieldwork Parfaits are a series of tart beers where we take a big and creamy base of oats and milk sugar, then sour them in our kettle until they are bright, acidic, and effervescent. We then ferment and condition the beer on heaps of pureed or whole fruit until the beer is almost opaque with color looking almost like a melted crayon. A small vanilla addition plays with the lactose to create a whipped cream-like flavor profile and mouthfeel that is just big enough to compliment the fruit without overpowering or taking away from the real star of the pour. Each fruit variation will look, smell, and taste quite a bit different, but all should be their own version of a blended fruit parfait with a tart, creamy, and fruity finish. Making beer is not the most glamorous of processes, it's factory work, and it is a grind... Days can be long and times can be trying, but the payoff can be huge in the friendships you forge. 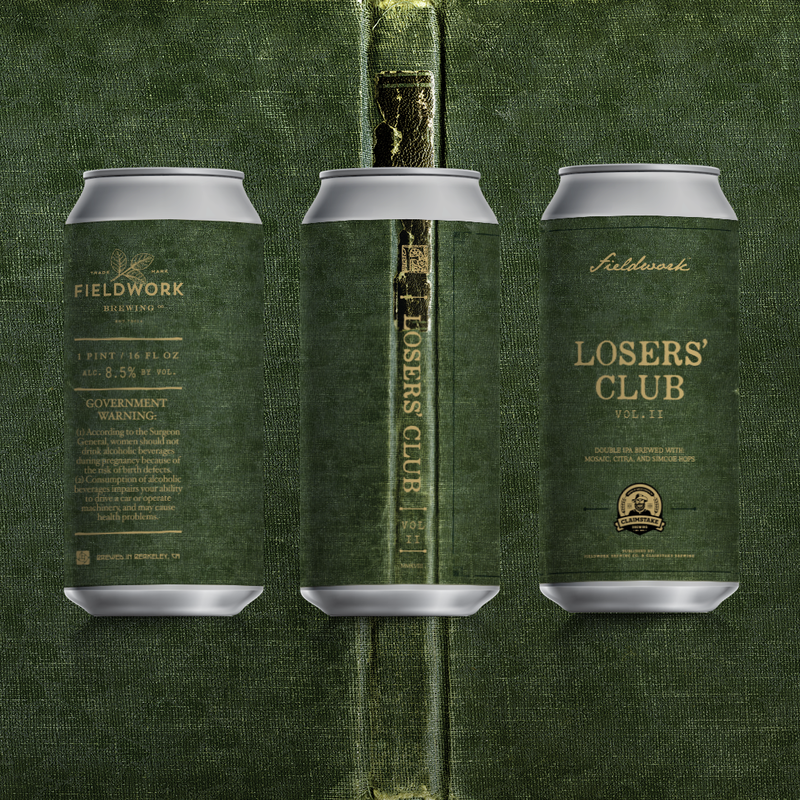 Our new series of Double IPA's named "Losers' Club" is just that, an invitation to the fellow Losers we've come to befriend to brew a Double IPA in their style and showcase what we all do best together. Vol. 2 we brewed with our friends from Claimstake Brewing; some of the most down-to-earth salt of the earth people we know. Showing off their swagger we brewed a well balanced and drinkable Double IPA with the heavier hitters Citra, Mosaic, and Simcoe. 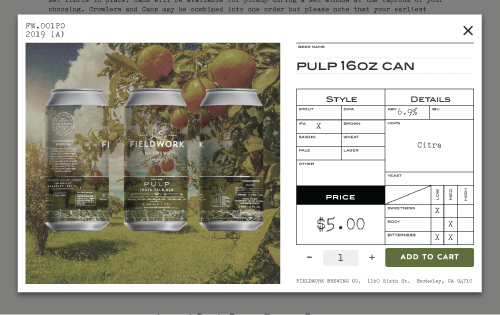 We're excited to offer the new option of ordering your cans online for this week's release. Pre-Order Your Cans for easy pick up at the taproom of your choosing within 3 days of their release. Supplies are limited so please note your order is only reserved once check out is complete. The ID of the person picking up the order must match the name on the order and the credit card. No proxies are allowed for pickup. If you do not pick up your order within the window they will be re-sold to the public and you will not be issued a refund. We have very limited cold storage and cannot hold orders in our coolers for long. Subject to limits and availability. Must be 21+ to purchase. Select your pickup location. 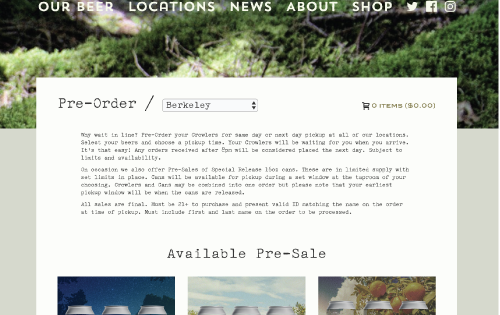 Choose beers available for Pre-Sale and add them to your cart and complete your order. Provide the name on your credit card and your phone number. Pay for your order using secure payment technology from Stripe. Must be 21+ to purchase and present valid ID matching the name on the order at time of pickup. If you are visiting the taproom just to pick up an order or get Crowlers or growler fills, be sure to step to the right side of the bar and order from our #ForAdventuresToGo area. We all love to take tasty beer #ForAdventuresToGo, but how do we ensure that we are getting the highest quality from our growlers and Crowlers? We thought we'd jot down some general guidelines for proper care of your offsite vessels. *Glass- Be sure your glass is clean and rinsed when you bring it in for filling. Don't use fat or oil based detergents, rinse well and air dry, extra points if you sanitize it too. When not in use, be sure to store your glass with the lid off. *Drink fresh- We suggest consuming both Crowlers and growlers within 3 to 4 days to avoid degrading quality (one week max) and be sure to store them cold the entire time. *Cover up- If your growler has another logo on it, be sure to tape over it. Growlers must reflect properly what is currently inside them. *Remember- that growlers and Crowlers are pressurized containers and can explode if not handled correctly. Do not expose them to extreme temperatures, like putting them in the freezer or leaving them in a hot car for long periods of time. 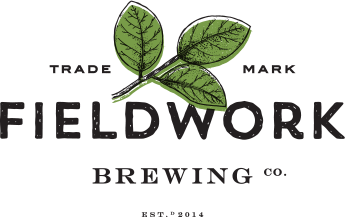 Copyright © 2015, 2016, 2017, 2018 Fieldwork Brewing Company, All rights reserved.